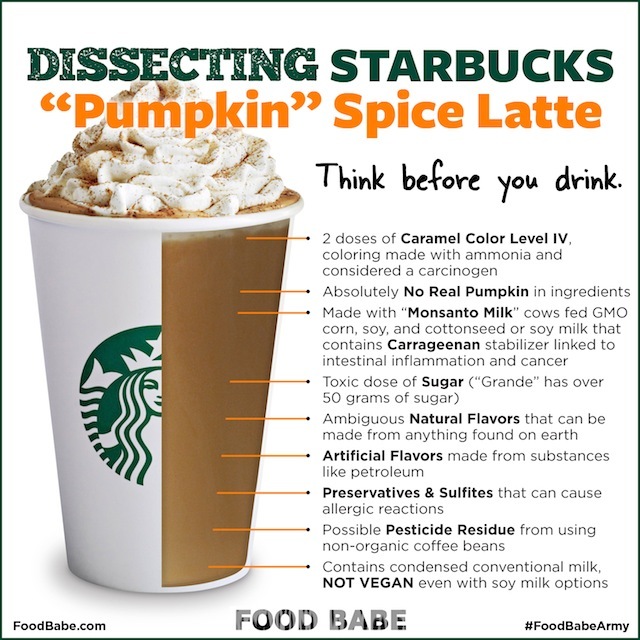 First of all there is no pumpkin in it at all, to be followed by a list of ingredients that are really harmful to your health. The amount of sugar in a grande is equal to 12 teaspoons or about 50 grams. A normal day of sugar intake should be 25 grams, and that would be sugars from all sources. The caramel coloring Starbucks uses is the dangerous 4-methylimidazole (4-Mel). There are four different classes of caramel coloring and two contain 4-Mel. Starbucks uses the most dangerous type or class in their syrups and whipped cream. Why would you need caramel coloring in a drink that is already brown?! Even though they stopped using milk from cows injected with growth hormones, their milk still comes from cows fed genetically modified feed. The high pesticide residues are from using non-organic coffee beans. Also the syrup labels state the use of natural and artificial flavors, which could be made from anything, especially since there is no pumpkin in the drink. A note to vegans, even if you order the drink made with soy milk, the pumpkin sauce contains condensed milk. And to add insult to injury, the soy milk contains a harmful additive carrageenan. Here’s a healthy recipe alternative that you can make at home where you have control over the ingredients you use! Instructions: Mix together all ingredients and top with homemade whipped cream and a dash of pumpkin pie spice or cinnamon.